Our homes are often the proud conveyors of our personal sense of style and fashion. We fill them with the decor that we love and designs that say as much about ourselves as they do about the house. However, sometimes the area that is most neglected is the outdoor space. If you love the outdoors and want to create a practical and stylish space to accentuate your home then read our handy hints on making your garden work for you. Without compromising on style, we show you how to make the biggest and best impact. You’ll be able to use these spaces in versatile ways and get the most from your home and garden. The first thing you could consider is how to bring the outdoors in. Or the indoors out? A good investment to consider making is the introduction of large double doors on the back of your property. See some examples in the new townhomes in Surrey, BC. You can now get stylish and affordable doors that perfectly match the rest of your home decor. Doors can be painted or styled to suit your own requirements. Black doors are completely in-trend at the moment and are worth considering. These would work well in a monochrome decor theme and are sure to make a statement. Doors leading onto a large, paved patio area make the perfect summer relaxation spot. This area would also work perfectly for entertaining and hosting guests. Bring your dinner party outside simply by sweeping open your glamourous double doors. A high-quality table and chairs set will make for luxurious seating that looks stylish and chic. Accessories your garden just as much as you would the inside of your home. Garden accessories can include candles, stoves and wood burners. Hanging lanterns are beautiful for evening entertaining. Don’t forget that solar lights are also a good addition. These not only look great but are good for the environment. If you work from home and have a large garden, then you could consider creating a stylish outdoor office space. These can be hugely successful design feature if you plan them correctly. Think about chic and modern designs that allow for full functionality. You want them to have electricity so that you can set up lighting and your computer out there. 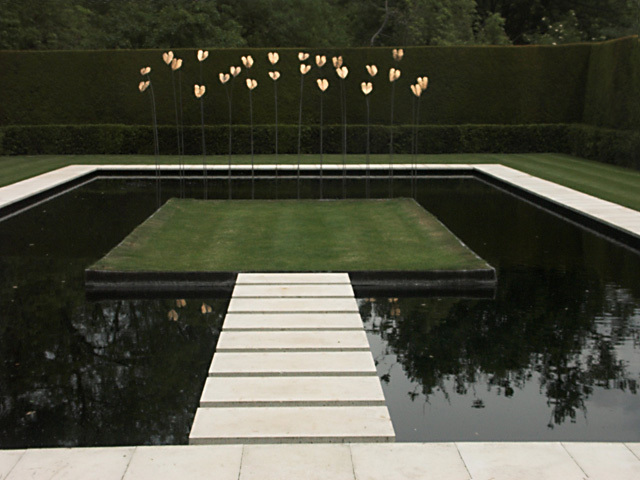 Adding a water feature can be a relaxing and beautiful addition to any stylish garden. You could consider building a pond. This is a wonderful way to de-stress. Just step outside and look at the fish, water insects and dragonflies that will be attracted to your pond. Creating ways to introduce nature to your garden is beneficial in keeping your gardens ecosystem flowing naturally. Making it visually appealing in the process. If you are a keen gardener then building a vegetable patch in the garden is also an option. You can live well from harvested foods, and you’ll know exactly where your food comes from at all times. Potatoes, leeks, carrots and herbs are easy to grow for the beginner. Good luck and remember to have fun with the whole process!